ALLIANCE, Ohio -- The Mount Union men's volleyball team dropped their final home match to Wittenberg, 3-0, Tuesday night at the McPherson Academic and Athletic Complex. The Purple Raiders (5-12) were led by freshman opposite hitter Mark Bruns (Columbus/Upper Arlington) as he tallied 12 kills against the Tigers. Setting up Bruns and the rest of the offense was freshman Jeremy Leyden (Cuyahoga Falls/Archbishop Hoban) and his 21 assists. Leyden aided the defense as well, alongside freshman libero Steven Grenier (Hawthorn Woods, Ill./Lake Zurich), as the two collected eight digs each to lead the team. Freshman middle hitter Sam Matonis (Macedonia/Walsh Jesuit) was strong at the net for the Raiders as he registered a season-high of five blocks. Wittenberg improves to 8-5 as they were led by Isaiah Brock's nine kills and four blocks. First set, Mount Union trailed Wittenberg by as much as five points at 22-17 but were able to go on a 6-1 run to tie the score at 23-23. The Raiders pushed the set all the way to 30 points, but would fall just short of Wittenberg at 30-28. Start of the second set, the two matched scores at 4-4 before Wittenberg started to pull away. Mount Union would not let Wittenberg get ahead by more than four points for their largest lead. The remainder of the set saw four more ties until Wittenberg's Isaiah Brock landed a pair of kills to finish off the set, 25-22. In the final set, Mount Union remained close with Wittenberg to only be down 9-7. Wittenberg responded, jumping out to a quick 15-8 lead, and never looked back as they ran away with the third set to win 25-15. 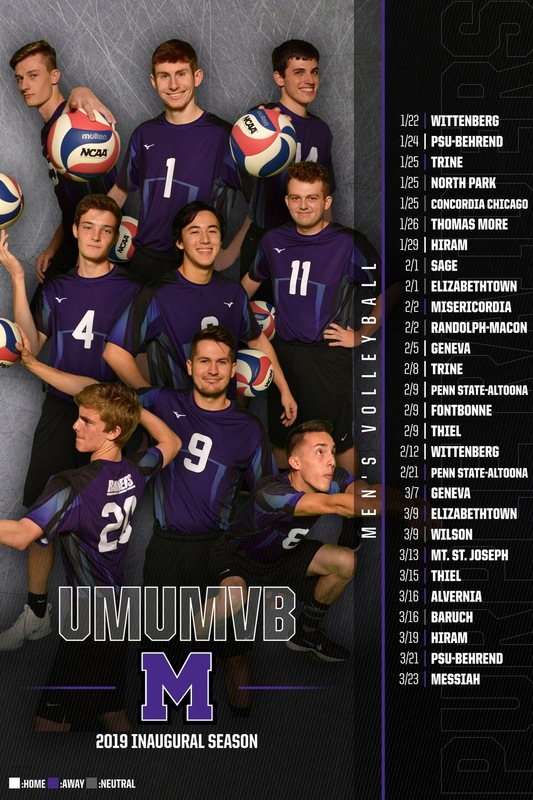 Mount Union is on the road for the rest of the season starting with a match at Penn State-Altoona on Thursday, February 21 at 7 p.m.